The December music season is firmly under way and some of us have been approached to cover the concerts live through our sketches on location. I chose to start off by attending a Ranjani Gayatri concert last saturday at the Bharatiya Vidya bhavan. The place was packed to the gills and overflowing and here's the view from my seat. The sisters were kitted out in perfectly matched two-colour alternating sarees as is their usual style. 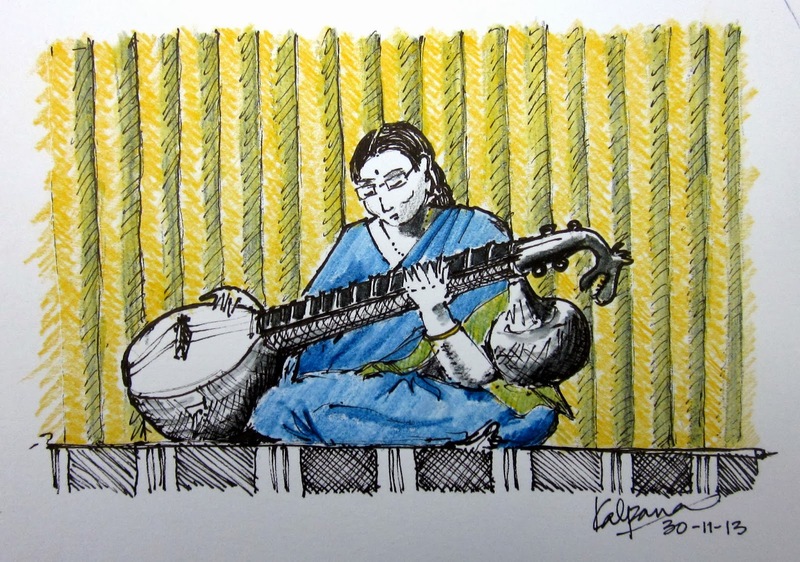 I also realised that the concert before it was a Veena recital by Geetha Krishnamoorthy. That was a bonus as two back to back vocal concerts would have been a little repetitive to sketch. The Veena is such a beautiful instrument. I got in before the Veena recital and got a central spot and started off. It was really enjoyable as sketching and listening to Carnatic music are both pastimes that I enjoy so much! Inquisitive mamis to my right and left kept leaning over exclaiming over my sketches. It was fun! And as the evening wore on my hand freed up and I dashed off a study of H. Sivaramakrishnan, the Ghatam accompanist as well. The sketch right at the top was actually my last and was thrilled to find it featured in the kutcheribuzz season blog . I hope I can squeeze in a few more such evenings. Wow kb!!! This is such a lovely post....very readable and with very nice sketches. 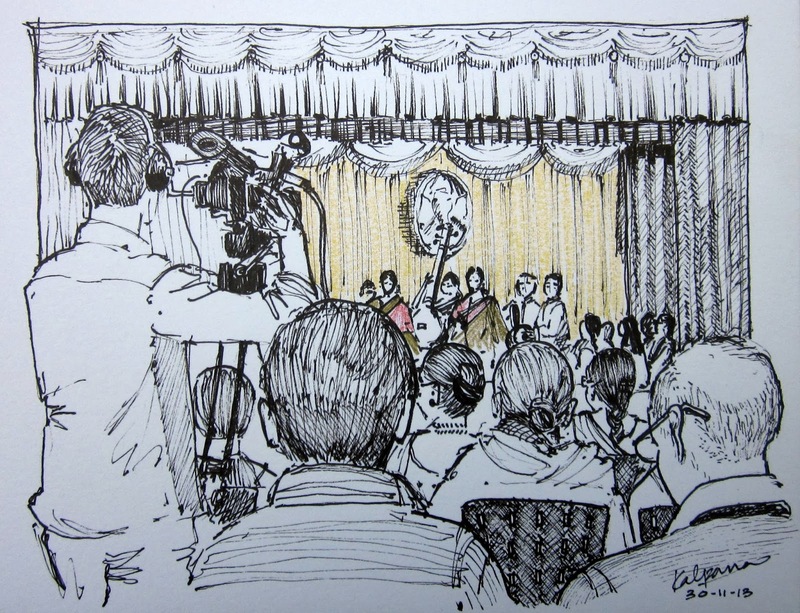 The details on the veena have come out very well and your sketch of the audience is so well done. 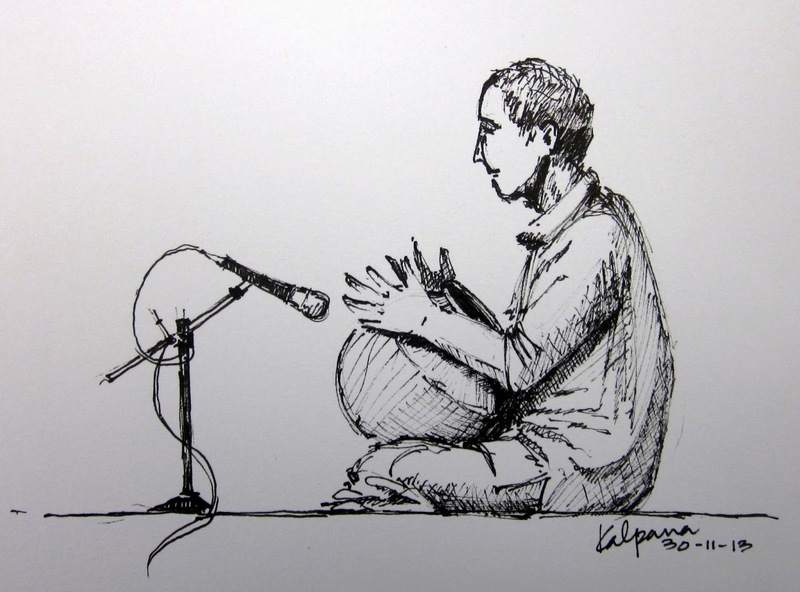 It captures the character of a carnatic music audience very nicely. Thanks very much Anantha Krishnan for visiting my blog often and for leaving such a nice comment!